We offer custom built products, unique products as well as a great warranty on our products. 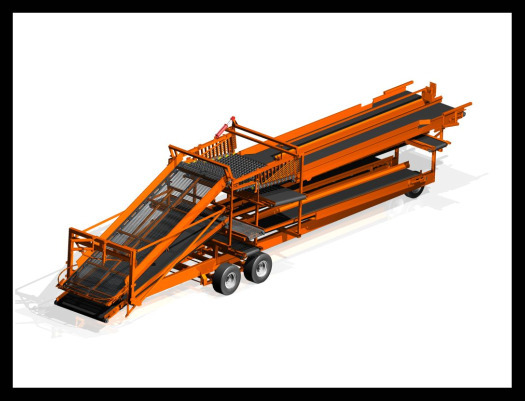 Below are a few examples of custom equipment manufactured to meet our customers' specific needs. The Milestone Star Sizing Roller & Dirt Eliminator Roller are more accurate and consistent than other rollers, all while keeping the product flowing quickly. 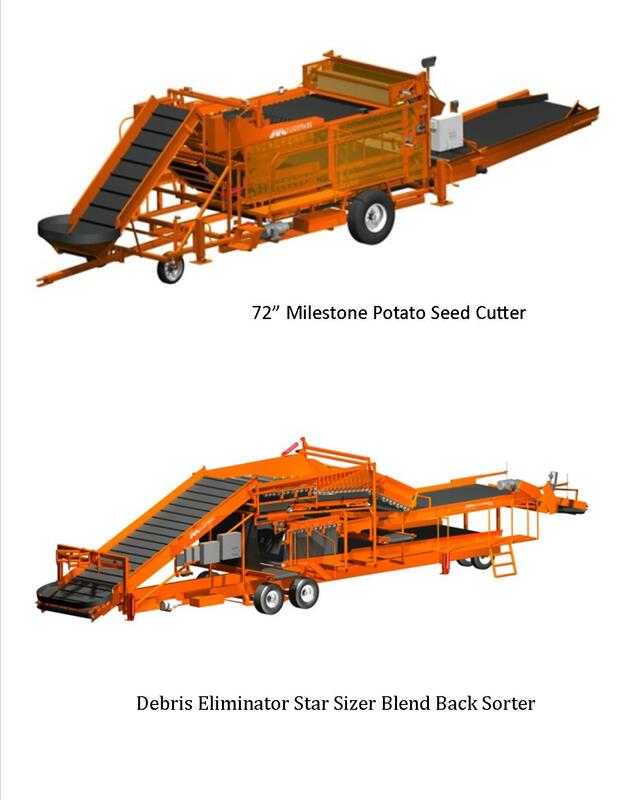 The Milestone Star Rollers are molded from low durometer rubber to be gentle on your potatoes while providing UV inhibitors to give you many years of trouble-free accurate sizing and dirt elimination. Milestone introduces the NEW EZ Connect Conveyor Coupling system. 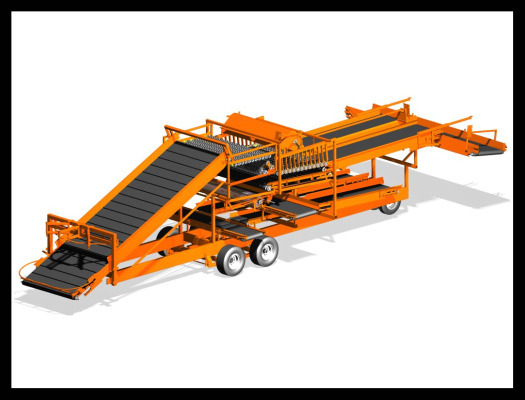 The NEW EZ Connect is a standard feature on the 2003 line of conveyors which are available in 24", 30", 36" and 42" widths. The EZ Connect allows you to quickly couple together or separate your conveyor line by simply dropping in or removing the pin. The EX Connect allows you to connect your conveyors on eneven terrain and once connected you can push or pull your entire line. A kit is also available for purchase to install on your existing Milestone conveyors or will work on different makes of conveyors. Urathane molding designs, urathane products, urathane applications. Leg belting stops lining and tracking problems. In 1961, Merthin Miles, Scott Brown and Owen Ward made a commitment to build a seed cutter they believed would change the potato industry. Through their energy and resources, along with hard work and many trials and tribulations, the Milestone Seed Cutter became a reality. 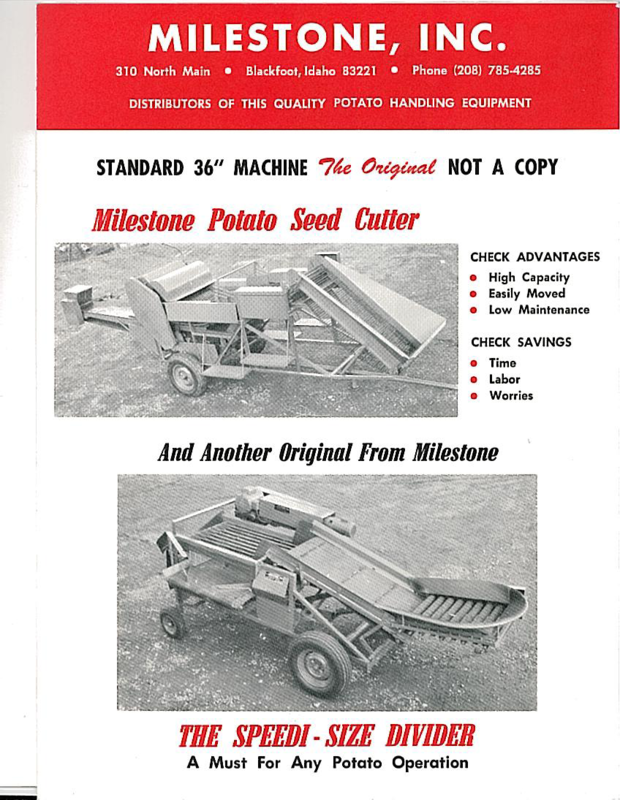 The seed cutter was the first product built by Milestone and today represents the industry standard for potato seed cutters. Not satisfied with just producing the finest cutters available, Milestone has diversified its product line since its humble beginnings and today designs and manufactures quality Sizers, Eliminators, Pilers, Conveyors, Treaters and more. Each machine built by Milestone incorporates many of the latest technologies and innovations while at the same time drawing upon Milestone’s years of experience. Focusing on Cutters and Handling Equipment has allowed Milestone to dedicate time and resources into developing some of the most innovative and effective pieces of potato handling equipment and cutters available today. At Milestone we are still looking ahead to the new challenges our customers may face and how we can help solve them. Our ambitious research and development plan hasn't slowed down since Merthin, Scott and Owen made their commitment to the industry all those years ago; and that guarantees Milestone will stay at the forefront of the potato equipment industry. Located in Blackfoot, Idaho U.S.A, Milestone is backed by years of experience and a reliable dealer network throughout the world.